The knife is perfectly balanced in my hand. It reminds of a scalpel: the healing steel. The honed blade glows dully. 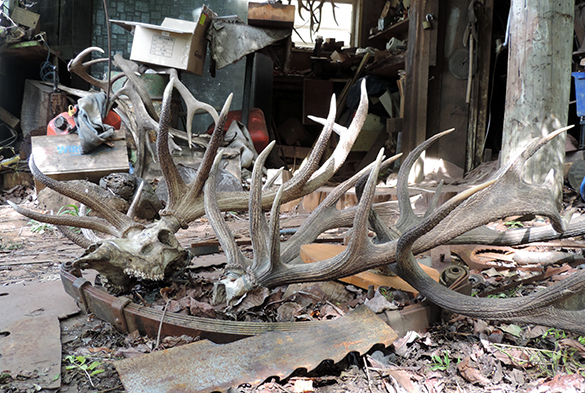 The handle is the fine antler of a one-year old stag. I want to use this knife but for a delicate task. 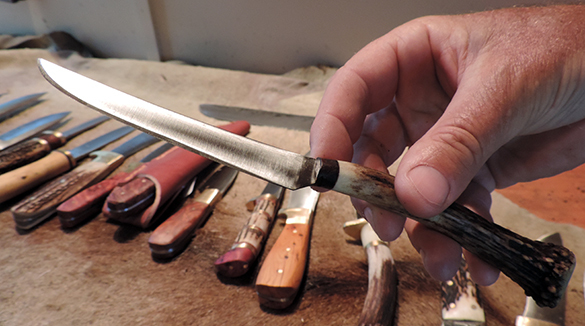 It is made by Ross Johnston, master knife-maker, at his Blackbird Valley forge near Nelson, New Zealand. Nelson – at the top of the South Island – was originally a small town serving an agricultural community. The climate is fabulous. The area is now a beach destination and the surrounding sheep farms are largely replaced by vineyards, olive groves and orchards. Many creative spirits have made this area their home; there are numerous galleries and studios all brimming with beautiful stuff. It is probably most famous as the birth place of the World of WearableArt. But today, I am looking for something more earthy; some uncut gemstone of kiwi beautiful stuff. A friend tells me I should meet Ross at his forge. 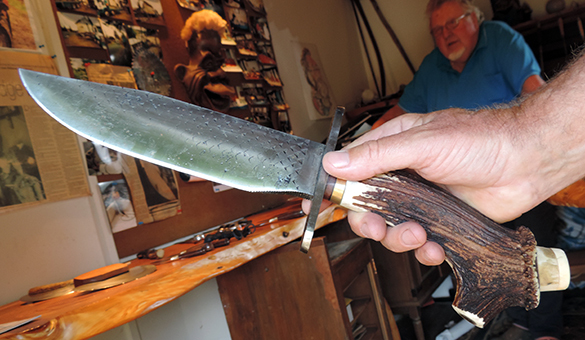 This former steeple-jack and deep sea diver has been making knives from recycled steel for forty years. His knives are his life and his passion. He is a big man with a big smile and big hands and a big handshake. 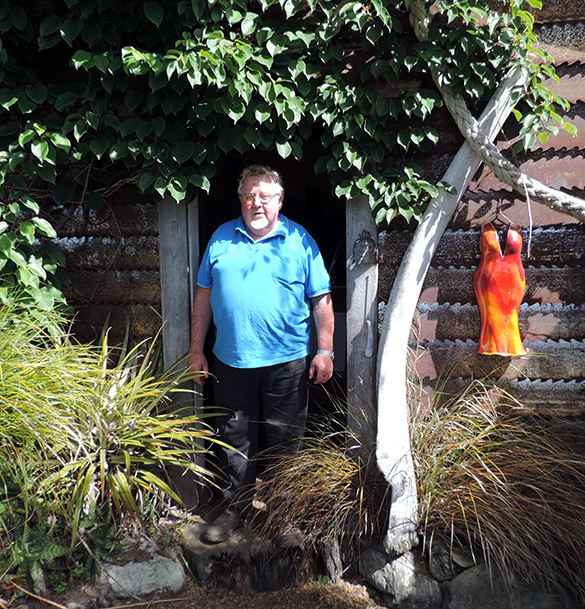 He is one big good old kiwi bloke! He gives me a big welcome. His knife shop is faced with sections of massive bandsaw-blades from local timber mills. Next to the door is the rib of a whale and a ceramic party-dress made by a friend. (So Nelson!) But before I see the display of finished knives, I want to see the forge: the first lines in the narrative of the knives of Blackbird Valley. The forge is everything I expect from a one-man outfit working steel: functional, untidy and honest. I am immediately drawn to what is simply scattered on the ground in front. I walk over fragments of old circular saw-blades, cut-up bandsaw-blades and vehicle springs. It is difficult to believe these can be transformed into beautiful glistening knives. 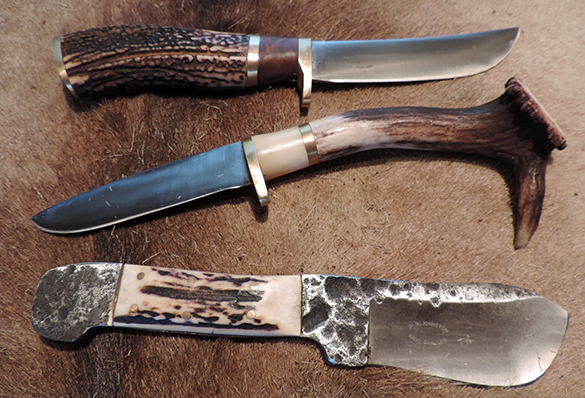 Also strewn around are deer antlers from trophy stags for the knife handles. This is the uncut raw material of Ross’s beautiful stuff. Ross displays his knives on a deer-skin. He recites the provenance of each blade whether Honda leaf-spring, circular saw-blade or part of a 19th century carriage spring found when digging in his garden. Ross is familiar with the properties and apperance – raw and worked – of each. He shows me a huge Bowie-style knife. Not really my thing. But I pick it up. It also has a pleasing weight and feel. It begs to be used. I wonder if I might just be ready for a discussion with Croc Dundee. What I love about it is that the blade is made from a huge wood rasp; this gives it a unique, scaley and rather sinister look. I then spy a knife that Ross has put aside assuming that I would not be interested. It is a simple flat file fashioned into an exquisite kitchen knife. The handle part has been made by cleverly twisting the file around itself so as to produce a perfect fit for my hand. It speaks to me. I fall for it and buy it. I feel its edge and see it slicing through the skin of a ripe tomato. 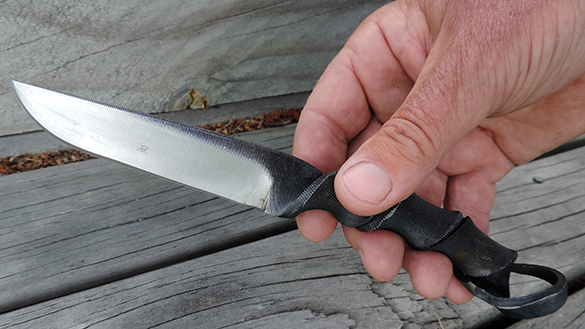 The knives of Blackbird Valley raise the whole question of aesthetics and function and the aesthetics of function. These are beautifully crafted objects without doubt; but the perception of beauty comes from picking them up, turning them in one’s hand and imagining their use. They become beautiful objects when looked at in terms of their potential function. The Blackbird Valley forge is worth a visit. It’s real-deal kiwi. And… you’ll find a knife that speaks to you! Nelson, New Zealand. A cute little town at the north of the South Island. It has become a bit of a destination. I visit the World of WearableArt™ and Classic Cars Museum to see the winners of the 2013 World of WearableArt™ annual show held in Wellington. WOW! The World of WearableArt™ seems to get bigger and better each year. The charming and helpful team at the museum tell me that there are plans afoot to make the show a truly international phenomenon. I wish them luck… but I don’t think they need it. There’s a certainty about the stellar destination of this enterprise. When the show goes on the road, I really hope we see it in Geneva.